The Parish Council is the Burial Board for the village's cemetery on Welford Road and administers the site. The cemetery was opened in 1858, originally with a Chapel of Rest for the spiritual provision of conformists and non-conformists in separate side chapels. Burials continued in the churchyard of the parish church of All Saints until 1904, since when all burials (except some burial of ashes within the church's designated Memorial Garden), have taken place in the cemetery. The Chapel of Rest was partly demolished in the 1960s and all that remains is the loggia that linked the two chapels, the arches of which have been bricked up to provide a dry store which is currently used by the village's Historical Society as a store for their large artefacts. At the rear is an arbour which has been created from the former verger's store by the Parish Council as a refuge for visitors to the cemetery. Grave space within the 'old' part of the cemetery around the Chapel is limited with over 1300 burials having taken place over the years. 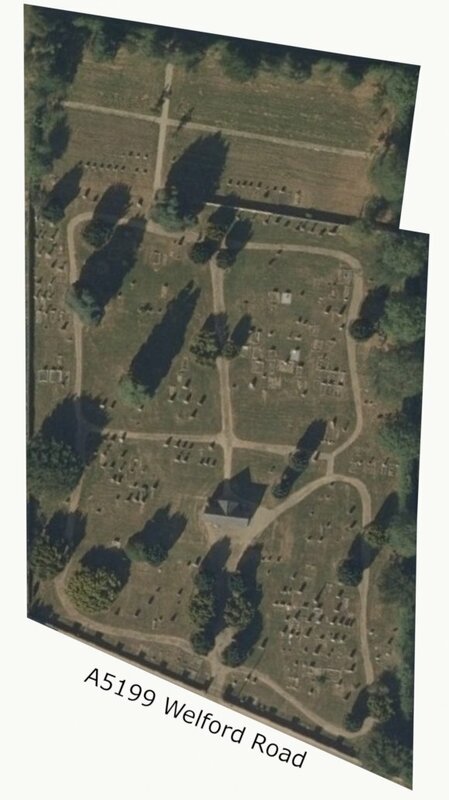 New burials are allocated in sequence within the 'new' cemetery extension to the west, although a small number of spaces may be available in the 'old' area. Grave spaces may be purchased. Please contact the clerk for more information. To aid maintenance, only lawn-level new graves, and headstones with vase memorials are allowed. A small space within the cemetery is also provided for burial of ashes with flat memorial plaques. Dogs are not allowed in the cemetery.